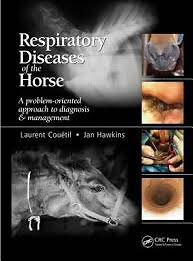 The authors provide a problem-oriented approach to the assessment and management of respiratory illness in horses. The book deals first with the anatomy, function and clinical examination of the respiratory system, followed by discussion of diagnostic tests and procedures. The clinical section is focused around the cardinal presenting manifestations of equine respiratory disease: coughing, nasal discharge, increased breathing efforts, respiratory noise, plus a chapter on congenital abnormalities. The text is presented systematically covering definition, aetiology, pathophysioplogy, clinical presentation, differential diagnoses, diagnosis, management and treatment. The book is illustrated throughout with excellent quality colour photos, diagrams and algorithms. It is of lasting value to equine specialists in practice and in training, and will be a useful reference for non-specialist practitioners.